This afternoon after I got the Bomber and the Airborn cleaned up from flight testing, I unbolted the SuperTiger G21/35 from the Fubar 600X airframe and removed the crankcase pressure line. While this line into the tank was not completely stopped up, it had a thick sticky residue on the inside. So I hooked up a line from the engine's crankcase pressure fitting and ran it into a bowl of water as shown below. 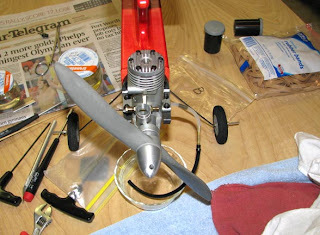 With the glow plug removed, I spun the prop, but there were no bubbles produced in the water. This indicated that the pressure fitting screwed into the upper left corner of the back plate was stopped up. I removed the pressure fitting from the back of the engine and found it was completely clogged up with a dark brown "grunt" that looked a lot like hardened varnish. Hanging dormant for four years had allowed the small .018" hole in the fitting to become sealed over. After soaking the pressure fitting in Acetone for about an hour, I used a .018" drill bit and reamed out the hole in the pressure fitting as shown below. Then I cleaned up the pressure fitting inside and out. I screwed the pressure fitting into the upper left corner of the back plate and reinstalled the engine in the Fubar airframe. 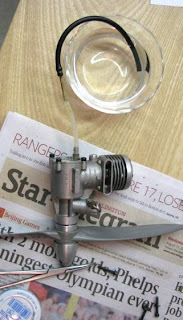 I filled the fuel tank with alcohol and put on the prop, but left the glow plug out. 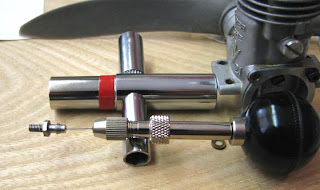 I put a black tubing extension on the fuel line and ran the end into a bowl as shown below. I spun the prop and the crankcase pressure pumped the tank completely dry! Wa-La, the problem is now fixed.